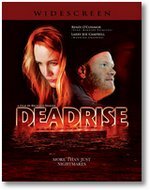 Here is the first review I've seen of Deadrise, the soon-to-be-released suspense/thriller starring Renee O'Connor and Larry Joe Campbell. Videoviews.org gave it 3-1/2 out of 5 stars. The only flaw the review mentions concerns the editing in some scenes. The reviewer noted there was good chemistry between Renee and Larry and they both did a good job of carrying the film. They said the film keeps you interested and the ending is not a predictable one. The video will be released on April 5th. Amazon.com and set for release on 5 April 2011.